If you unfold Andy's Google map of Ipswich coffee and tea shops -- go on, have a quick look -- you'll see that there's a cornucopia of cafes in the town centre and precious few in the 'burbs. Honourable non-supermarket exceptions would include Al's, Kenny's and Mega Byte, any of which could feature Ian Beale behind the counter. Who's taking care in the community? That would be a matter of Taste, a self-proclaimed "church led" (not the stuff that keeps getting nicked off the roof) "community cafe". Affiliated to sizeable St John's round the corner (cf River Of Life), they've recently opened up on Woodbridge Road near Sidegate Lane. We're here on a Tuesday. Why? Most days they close at midday but today they're open for lunch. Those limited hours are what you get when you rely entirely on volunteers. Political itch scratched, let's move on. Aware that Andy was Brompton-ing into a mighty headwind, I got chatting to some other customers about the invaluable and revitalised Ipswich Film Theatre. 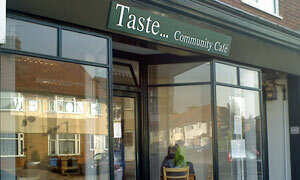 Discussing a community based cinema in a community cafe, we very nearly vanished into a voluntary vortex. Behold my bottle of Drench (half the price that it was at The Range) and a home grown fruit scone. Savoury options are, at best, limited, due to food safety rules. Only when Andy was tucking into his two bits of cake did we discover that those Tasty folk have an understanding with neighbouring Victoria's Bakery: "you're welcome to buy something from next door and eat it here". Which we duly did, going back from sweet to savoury with our breakfast baps. Over coffee and a free Lichfield cafe caramelised biscuit -- Fairtrade -- we had an informative chinwag with the nice couple giving up their time and minding the shop today. Apparently there's a knitting group meets here, they're hoping to extend their opening hours, they might get WiFi, they'd like to offer hot food, etc. Early days. We paid up, a paltry amount, and cycled off. Good luck to 'em: Taste's good. If it was a car -- Peugeot Boxer 17 Seat Minibus. If they were passing by -- Roger Lloyd-Pack.